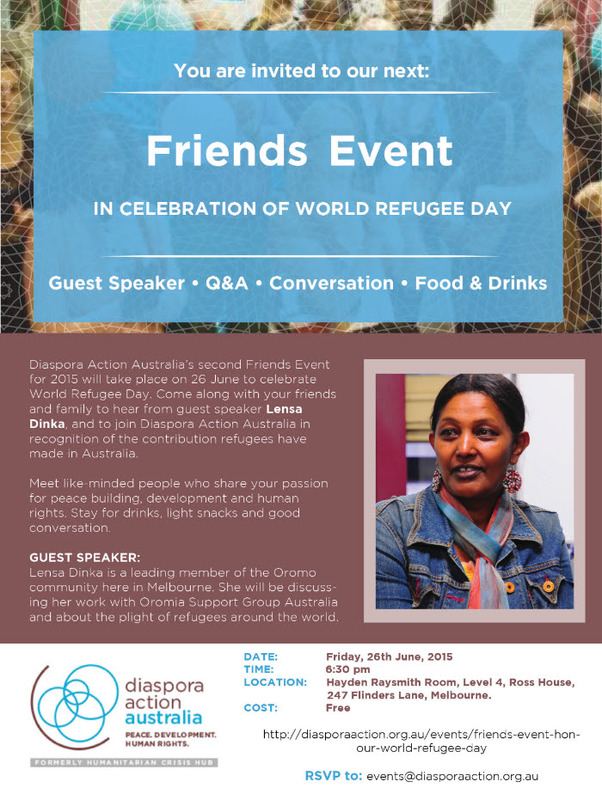 Diaspora Action Australia’s second Friends Event for 2015 will take place on 26 June, in honour of World Refugee Day. This event will give attendees the chance to learn about and acknowledge the important contribution made by refugees to our community. Come along to meet like-minded people who share your passion for peace building, development and human rights. Stay for drinks, light snacks and good conversation. Speaker: At this Friends Event we have the privilege to hear from Lensa Dinka, a leading member of the Oromo community here in Melbourne. Lensa has worked with the OSGA, a group dedicated to raising awareness of the human rights issues affecting the Oromo and other oppressed peoples in Ethiopia. She is also involved with the AFAAN, a group dedicated to revitalizing the Oromo language. Don’t miss the opportunity to hear Lensa’s story! Lensa Dinka is a leading member of the Oromo community here in Melbourne. She has worked with the OSGA, a group dedicated to raising awareness of the human rights issues affecting the Oromo and other oppressed peoples in Ethiopia. The Oromo people make up one-third of Ethiopia’s population and have lived with conflict in their region for more than 100 years. Lensa has also worked with AFAAN, a group dedicated to revitalizing the Oromo language, and is the convener of the Oromo Radio Program, providing news and information to the Oromo community here in Melbourne. This Friends Event will celebrate the courage of refugees. It will give attendees the chance to learn about and acknowledge the important contributions made by refugees to our community. Through our work with diaspora community organizations, Diaspora Action Australia understands the fundamental contribution they can make to peace, and human rights in their country of origin. We understand that were it not for the courage of refugees — and the goodwill of those ready to welcome them into their homes — Australia would not be the country it is today. We are a nation of peoples propelled here by the common desire of a peaceful and happy life, free from the threat of violence and persecution. Diaspora Action Australia embraces and honours the spirit of World Refugee Week. The Friends of DAA Network is an initiative launched by Diaspora Action Australia in late 2013. It is a network of dedicated people who have donated much of their time to work with DAA. It is people who are passionate about supporting diaspora organisations, it is communities that have worked with DAA, and it is previous staff and volunteers who have helped to shape the organisation. As part of the Friends Network, Diaspora Action Australia organises several social events throughout the year. They are a great way to hear from wonderful speakers, and to connect with other like-minded individuals who share a passion for peace, human rights and development. We hope to see you there!